Hither Green Ditch or Hither Green Quaggy is a short tributary which flows, hidden, through parts of Downham, the borders of the Corbett Estate and Hither Green. 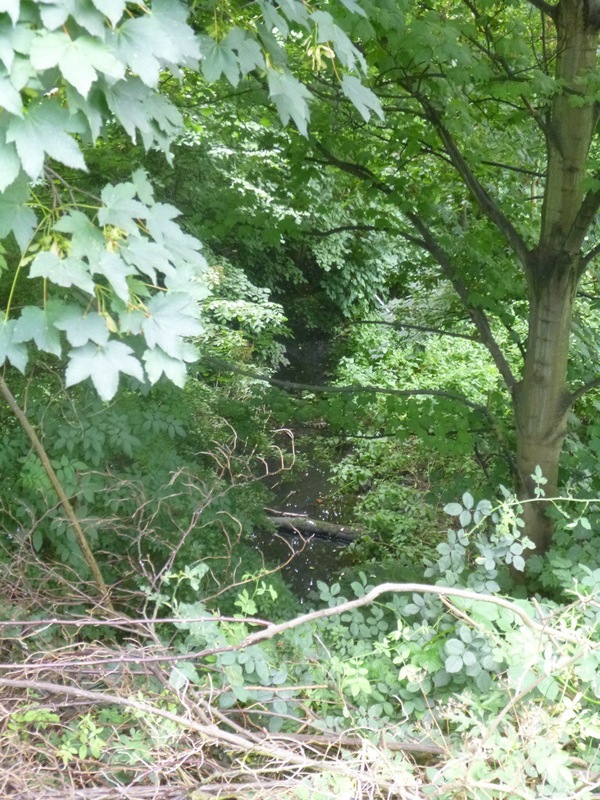 The nomenclature ‘Ditch’ is used quite a lot within the Quaggy catchment, it shouldn’t be seen as belittling of derogatory it is just the way smaller streams are described – there are Milk Street, Grove Park, Border and Petts Wood further upstream. Like the Quaggy itself, there are probably several sources to the stream. There is certainly some evidence on a 1920s OS map of a thin blue line going back towards Grove Park across the railway. Any evidence of contour lines that would have supported this as a source were obliterated with both the construction of the main line and the railway sidings. There is some support for an east of the railway source on the Environment Agency flood risk maps too. To the west of the railway, there were ponds on Shroffold Farm (now the location of a mosque at the junction of Verdant and Whitefoot Lanes and Northover, which Ken White (1) had the source as – he is almost certainly right. While the pond may have been fed by a small spring – there may also have been some run-off from the area around Whitefoot Lane, which is gently sloping down towards the former pond at this point. (See map below on a Creative Commons from the National Library of Scotland). Another branch is clear too from the tell-tell notches in contour lines of fluvial erosion on Ordnance Survey maps point further uphill, towards the top of the hill on the Downham Estate. While the stream wasn’t marked on old Ordnance Survey maps – it may have been dry by then – its course is obvious on the ground with distinct dips on Tristram and Camlan Roads, similarly there is a depression where it would have crossed Northover at its junction with Durham Hill and Shroffold. The north easterly course becomes slightly less distinct as land flattens out crossing Roundtable, Pendragon and Ballamore Roads. There is a clearer depression in the north eastern end Reigate Road, where there is an attractive grassed square surrounded by houses. These houses have problems with damp and there is local knowledge of an underground stream there (see comment from Brian below). 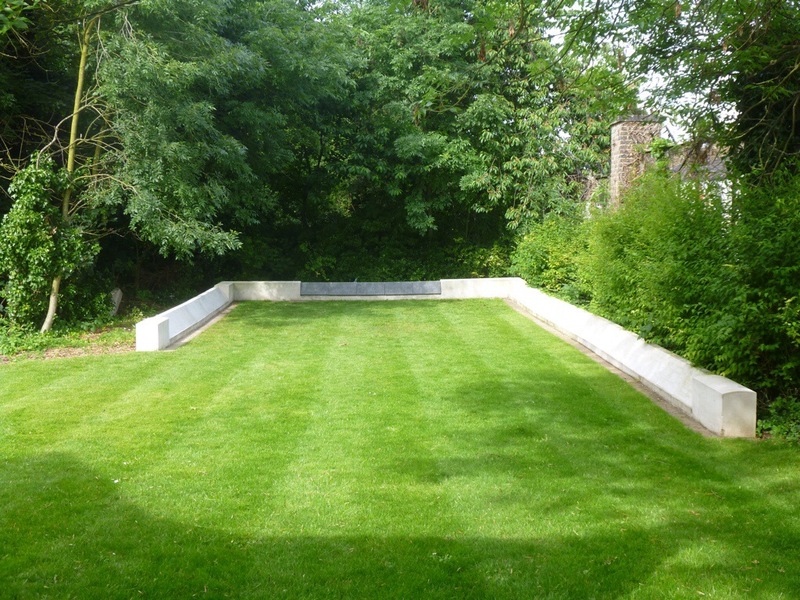 There is also a distinct dip Railway Children Walk (named after the Edith Nesbit book – Nesbit lived for a while in Tree Gables on the opposite side of the railway). The ‘Ditch’ would them have continued into what is now the cemetery – although its current route would be blocked by a relatively recent mound of earth; the flood risk map (towards the top of the post) shows its likely route quite clearly too. A 1961 OS Map shows both the branches still partially visible at that stage (on a Creative Commons from the National Library of Scotland). Once in the cemetery there is a perceptible dip suggesting a course. 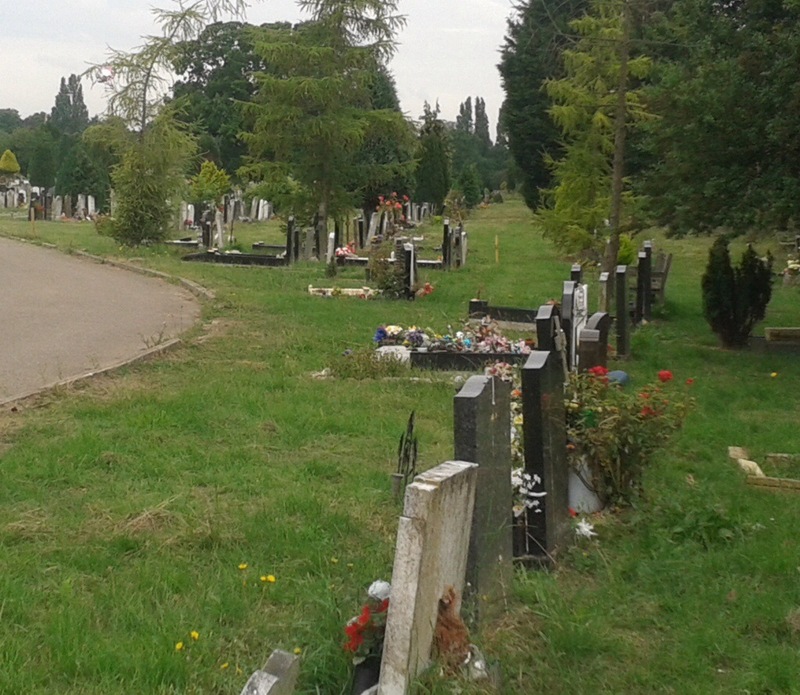 The cemetery has two distinct elements – initially the course is through the bleaker twentieth century part with more regimented lines of graves, fewer mature trees and with a partial backdrop of the railway sidings and yards. It has a slightly desolate feel to it when compared with the delightful, slightly overgrown Victorian northern quarter with a decaying dissenting chapel (built by William Webster, covered by Running Past in 2016) – partially destroyed by a World War 2 bomb. Before leaving the cemetery, a detour of a hundred metres or so to the south of the chapel is worth making to the memorial to the Sandhurst School disaster, where 38 children and six teachers died in a day time bombing in 1943, perhaps more on that another day. At the north of the cemetery there is what looks like a ditch, while the was no evidence of any water it seems likely that this was its course as a local resident remembers a stream at this point (see comment from Dean). He also recalls it being piped to follow a course behind South Park Crescent and then towards Oak Cottages. This is certainly the route that contour lines would suggest. The stream would have joined the now not particularly Verdant Lane just beyond Pasture Road – there is a clear dip in the road, adjacent to the Verdant Lane Community Wildlife Garden. 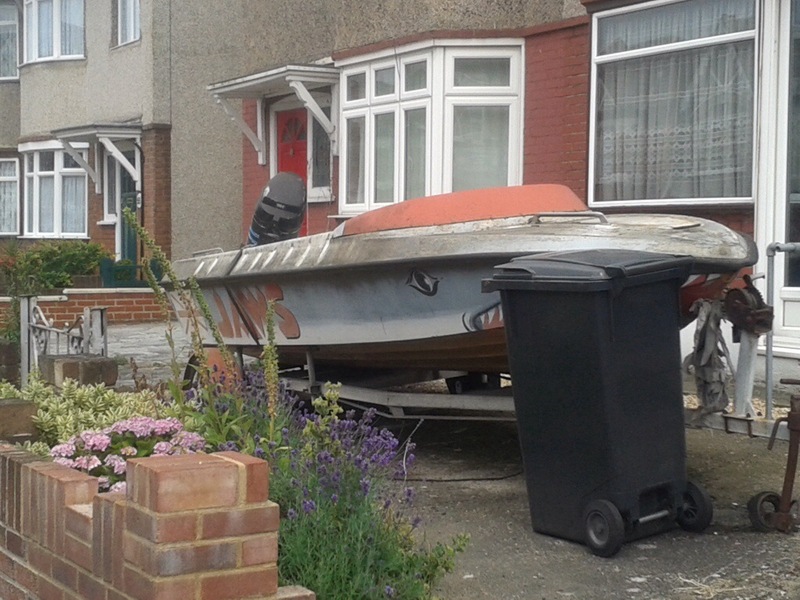 There is no waterway to see, although there is a speedboat that has been ‘moored’ in a front garden for as long as I can remember. At around this point, close to the junction with Sandhurst Road, Hither Green Ditch would have been joined by another small stream, which can be traced through the Corbett Estate. Going up stream, probably crossing Minard Road mid-way between Dowanhill and Hazelbank Roads and crossing Dowanhill Road around its junction with Broadfield Road – in quiet moments there is the sound of water beneath manhole covers at this point. The contours are visible on the 1961 1:25,000 Ordnance Survey map below, (on a Creative Commons via the National Library of Scotland) with just perceptible dips in the roads. While I didn’t hear any sounds of subterranean water emerging from manhole covers – those who live there have heard them around these streets. There is also evidence there of a water-filled ditch at the back of homes on Hazelbank Road and the Excalibur Estate, there is a thin-blue line on the 1961 map and seemed big enough for a swan to be able to use it (see comment from Diane on one of the posts on the Quaggy). It seems to have had an issue behind 244 Bellingham Road and disappeared into a sink between 143 Hazelbank Road and 6 Wentland Close – see map below on Creative Commons via National Library of Scotland). There are clear sounds of water rushing below the street from a couple of manhole covers at the northern end of Longhill Road, but the sounds peter out further south; it may be that the source is on the eastern side of Forster Memorial Park, but there isn’t any cartographical or on the ground evidence of it. There seems to be a second source for the tributary – water below a pair of manhole covers can be clearly heard at the T junction of Castillon Road and further north on Broadfield Road, close to the junction with Hazelbank Road. Similar pairs of manhole covers and dips in roads can be seen on Gilton Road and on Waters Road, but, sadly given the street name no sound of water, nor was there any clear evidence further south. This tributary stream probably provided the water for South Park Farm, a small farm of around 70 acres centred around Dowanhill and Hazelbank Roads. After moving to somewhere around the Torridon and Brownhill Roads junction, the farm was renamed ‘Longmisery’ (2). It merged with North Park Farm (which we will ‘visit’ further downstream) in the mid-19th century. Perhaps this small stream should be called South Park Ditch. The main stream’s original course would have taken it across what is now the South Circular just to the west of the railway bridge before being bridged by the railway behind the junction of Springbank Road and Hither Green Lane. To the east of the railway it flowed through what are now the gardens of Milborough Crescent, just south of its junction with Newstead Road. The Crescent followed the long curve of the stream before it reached and was bridged by the railway on Manor Lane. While it is not visible at this point, it is certainly still flowing – there was a serious diesel spillage in early 2016 in the yard which polluted Quaggy and lower reaches of the Ravensbourne. The stream flowed alongside Manor Lane for another couple of hundred metres before turning west-north-west and meandering across the line of Longhurst Road, joining the Qauggy where it dog-legs to the north. This is all now covered. Around here the stream would have been joined by a small tributary that seems to have ‘risen’ just the other side of the railway on what was North Park Farm which was roughly in between where Duncrievie and Elthruda Roads are now. The sale of the 278 acre farm to Archibald Cameron Corbett in 1896 was to allow the development of the western side of the railway. 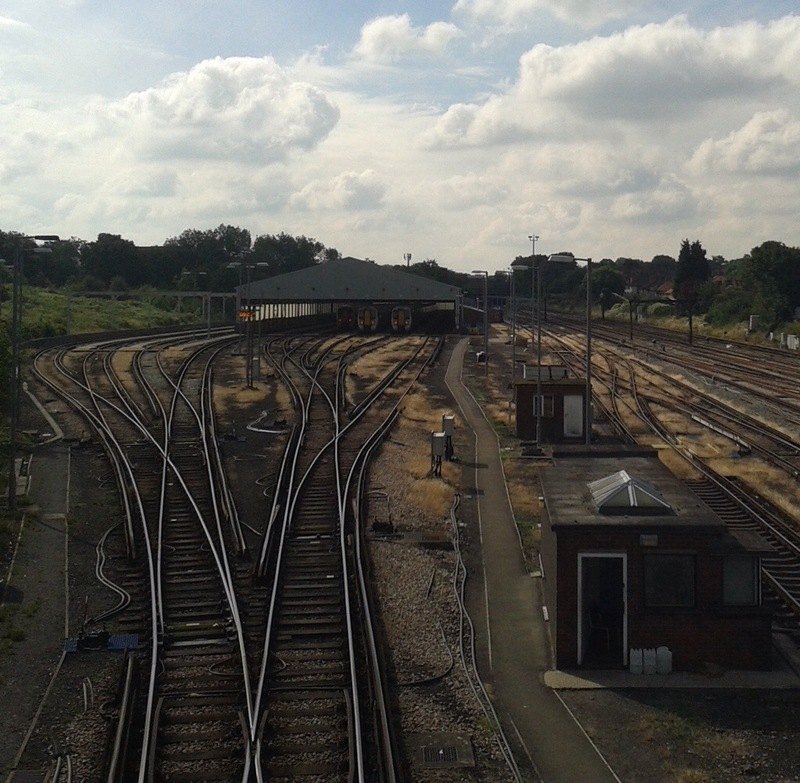 Despite being a junction for around 30 years, Hither Green had only opened as a station in 1895. 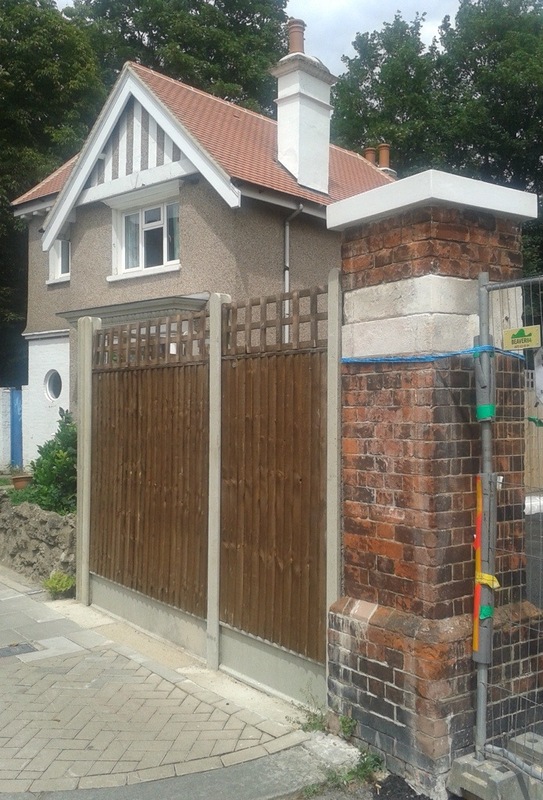 A new booking hall was built to the west of the station in Springbank Road as part of the development – its red brick gateposts are still visible as the entrance to a new housing association development. The original stationmaster’s house survives, adjacent to the gates, at 69 Springbank Road. The tributary flows through the nature reserve of Hither Green Triangle between platforms 4 and 5 of the station; this offers the only above ground remnants of the tributary or indeed the main stream. From the far end of platform 5, the stream is just visible, way below the platform level – not surprisingly given the viaduct the railway is on. The water was glistening in the sunlight when I visited. While access to the nature reserve is rightly limited, its management plan, while confirming the stream’s presence gets its direction of flow wrong (although the original mistake seems to lie with the now defunct London Ecology Unit). The tributary would have originally emerged from the embankment from platform 6 somewhere between the house and the bus stop before trickling on towards Longhurst Road. The final outflow of the substantive stream into the Quaggy would have been around where it is bridged by Fernbrook Road, although nothing is obviously emerging from the brickwork ‘bank’, presumably long since culverted away. This entry was posted in Cemeteries, Rivers and tagged Archibald Cameron Corbett, Hither Green Cemetery, Hither Green Ditch, Quaggy, Quaggy Hither Green on July 18, 2014 by Paul B.
Today’s post thunder and lightening run took in two places I never tire of – Brockley and Ladywell Cemetery and it’s older counterpart at Nunhead. 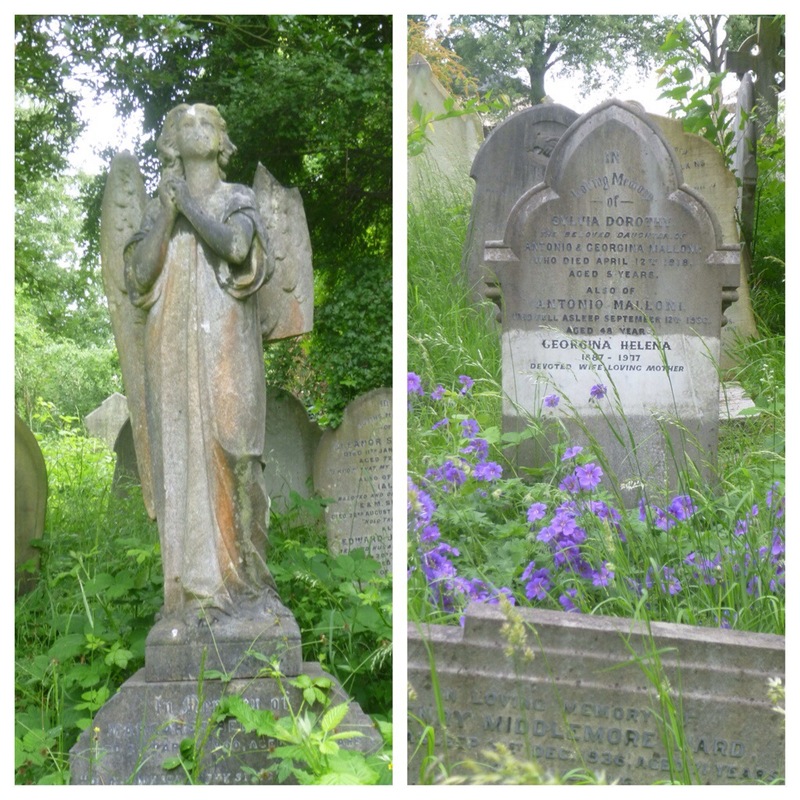 The geraniums in one of the overgrown parts of Brockley and Ladywell caught my eye as I ran past as did the angel with broken wings and a slightly eroded face. 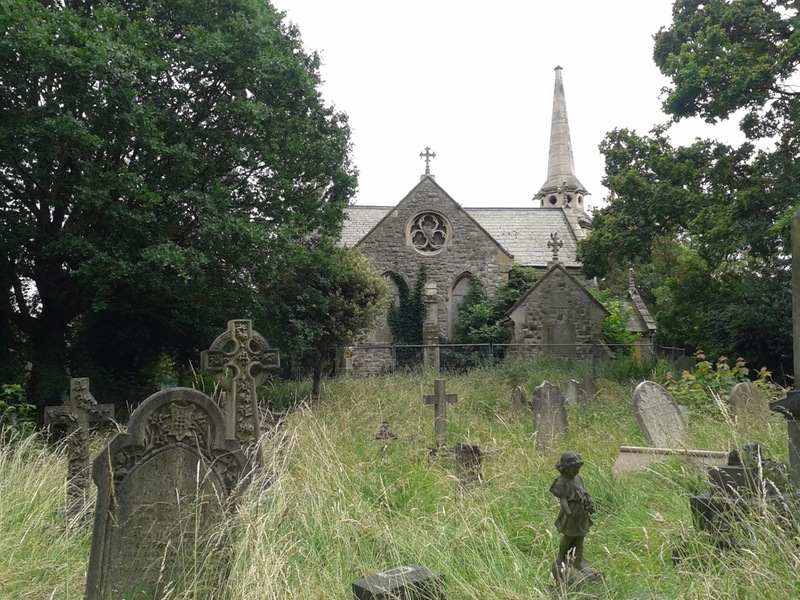 Nunhead has some rather more ostentatious memorials and is much more overgrown. 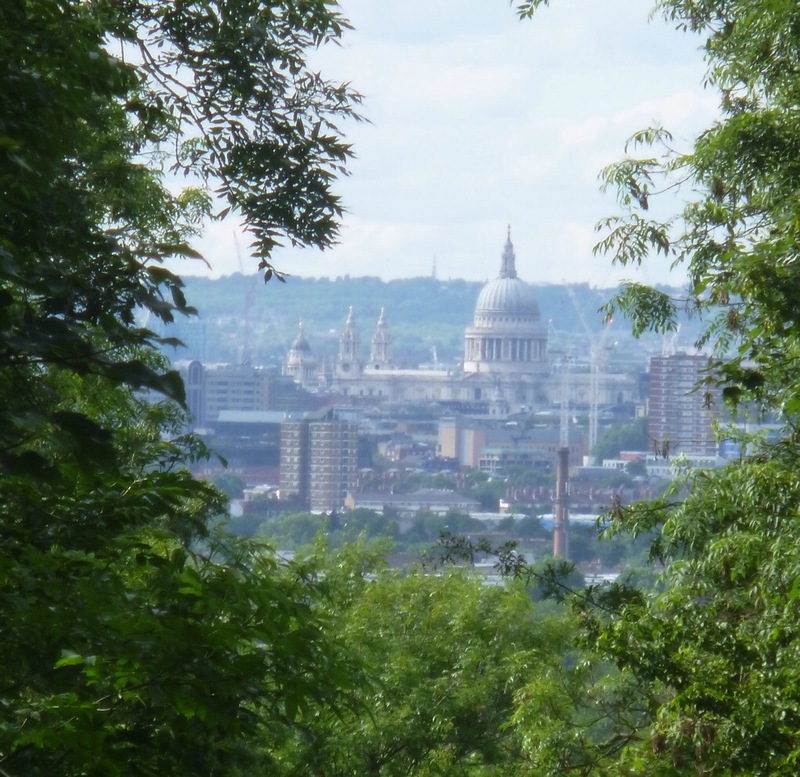 It has one of my favourite views in London – a tree framed vista of St. Paul’s Cathedral which was very clear indeed today after the morning’s heavy rain. After yesterday’s D Day anniversary commemorations, I paused by the low walled WW2 memorial, which is very different to the rest of the Nunhead, but a peaceful reminder of the sacrifices made. Finally, one thing I forgot to post last week which was slightly embarrassing, I was out-paced by a man pulling a tyre. In my limited defence, it was alongside the athletics track in Ladywell Fields where Kent AC’s top sprinters were doing a resistance session. 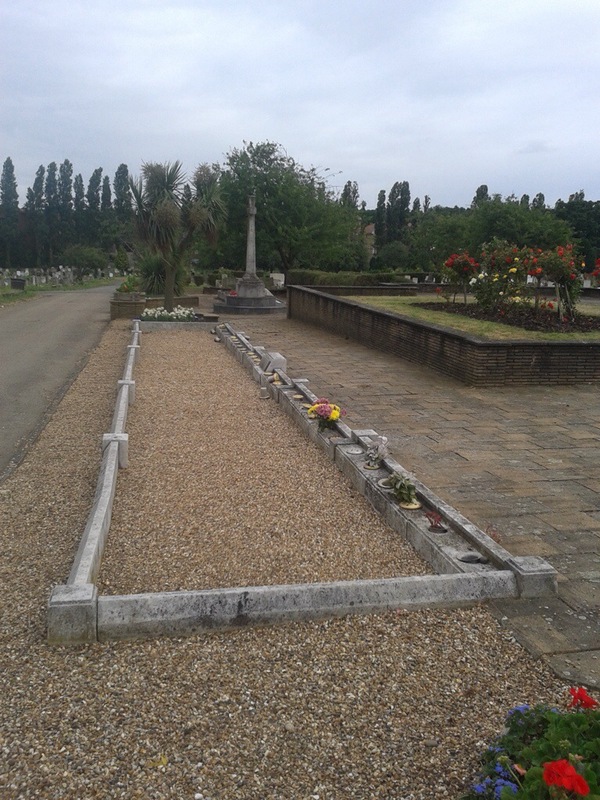 This entry was posted in Cemeteries, Lewisham History, Running, Southwark History, War Memorials and tagged Brockley & Ladywell Cemetery, Nunhead Cemetery, WW2 on June 7, 2014 by Paul B.